Description: We are showing two options for stitching Angels Unawares. Both choices are done with one strand of Weeks Dye Works and Sampler Threads over one linen thread. If you choose to use any other fiber, you will not get the same appearance as our model. 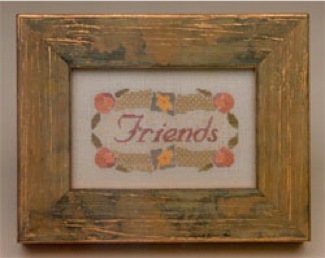 You can certainly stitch any of our designs over two linen threads, but will require different framing or finishing. 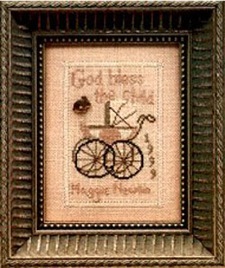 Framed in an Olde Colonial frame, our model is stitched on 32-count Light Mocha Belfast by Zweigart from Norden Crafts. Stitched on a pre-finished large box from Adam Original allows for personalization. 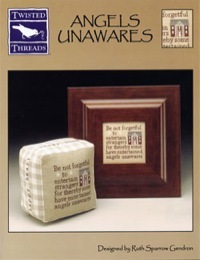 Angels Unawares is stitched on the front of the box which is 27-count Natural linen. On the gusset which is 28-count Riviera Gingham (Cream/Natural), we have added our own verse to the sides and top. Happy Heart on the left gusset, Happy Home on the top gusset and Happy Life on the right gusset. We have also provided an alphabet and numbers to add personalization to the back of the box. Ours has a name and the year. We put each letter and number in a single gingham square. 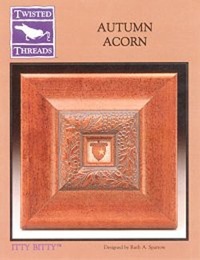 Description: Autumn Acorn is truly an Itty Bitty design! Stitched on 32-count Natural Sienna linen from Norden Crafts, Ltd., if stitched over one linen thread it will measure less than 1". This piece was inspired by the wonderfully wide frame from Bob Reed at Olde Colonial Designs. When Bob showed this frame to his wife, Pam, she asked, "Who in the world would ever use this frame? ", and he quickly responded, "Ruth!". We've stitched ours with Weeks Dye Works and Anchor floss. Description: Inspired by the awesome frames from Olde Colonial Designs, Autumn Bird is the perfect companion piece to Autumn Acorn and Autumn Pumpkin. Stitched on 32-count Natural Belfast Zweigart linen from Norden Crafts with one strand of floss over one linen thread. Our design uses both Anchor and Weeks Dye Works, but a conversion for DMC is provided. 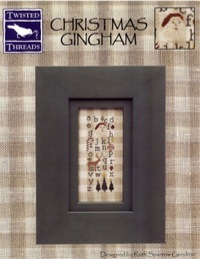 Description: Autumn Gingham is stitched on a delightful linen from Italy, 28 count Riviera Gingham (Cream/Natural) by Graziano courtesy of Norden Crafts, Ltd. over one linen thread with one strand of Sampler Threads from The Gentle Art. If you choose to use any other fiber, you will not get the same appearance as our model. Each section of the Gingham linen is 12 x 12 stitches, so we used a 12 count grid to match the linen threads which makes for easy placement of the design. 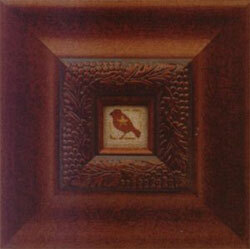 Our frame (X2359 3-1/4" x 4-5/8") is from Olde Colonial Designs. 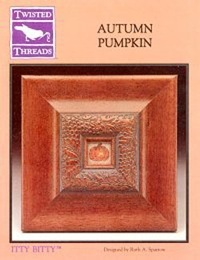 Description: Autumn Pumpkin is a companion piece to Autumn Acorn and is also framed in the wide moulding with a 1" opening from Olde Colonial Designs. Stitched on 32-count Natural Sienna linen from Norden Crafts with Weeks Dye Works and Anchor floss. Description: 32 count Natural linen/silk (45B) from Wichelt Imports with Anchor floss and Mill Hill Treasure (12192). Color choice for either a girl or a boy. Stitches include smyrna cross, rice stitch and pins. Stitched over one linen thread. This chart is a jpeg and can be saved to your computer. Description: Our daily inspiration, Be Joyful is stitched on 32 count Light Mocha Belfast linen by Zweigart from Norden Crafts with one strand of Anchor floss over one linen thread. Scotch stitch is used for the border. We put ours in a mirror frame from Olde Colonial Designs. Description: 32 count Antique White Belfast linen by Zweigart from Norden Crafts, Ltd. over one linen thread with one strand of Sampler Threads and Weeks Dye Works. This design may be stitched on any count of linen and the charm will be centered in the center of the red block. 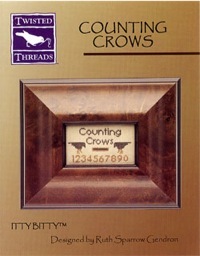 The frame size shown is for 32 count linen stitched over one linen thread. If you choose to use any other fiber, you will not get the same appearance as our model. 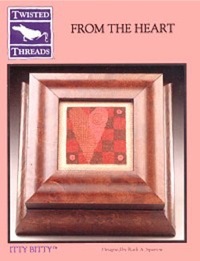 The heart charm (CH06) is available through Twisted Threads. Framed in a double East Side Mouldings frame 3300BK/3100BK. This design is dedicatedto my incredible mother, Bette Sparrow. 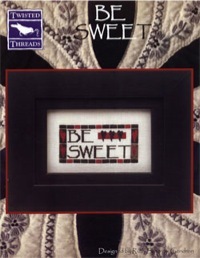 Momma turned 88 on January 7th, 2005 and there are those days that I must remind her to “Be Sweet”! When she came to live with me last July, I did her room in red, black and white, because her favorite color is red. The black and white quilt shown in the background of the front cover is the first quilt my mother made almost 60 years ago! Description: 32 count Summer Khaki Belfast linen by Zweigart from Norden Crafts with Sampler Threads from The Gentle Art and Anchor floss. Stitches include smyrna cross and satin stitch. Stitched over one linen thread. Frame (2200BK) from East Side Mouldings with Larson Juhl filet (151 1G). Description: Bunny Gingham is a whimsical design from our Gingham Series. 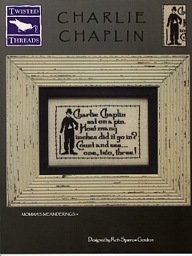 Stitched on 28-count Riviera Gingham (cream/natural) linen by Graziano, from Norden Crafts over one linen thread with one strand of Sampler Threads from The Gentle Art. The chart uses a 12-count grid to match the linen for easy placement of the design. We framed ours in a double frame (3100CI/3200CI 5 x 3-1/2) from East Side Mouldings. 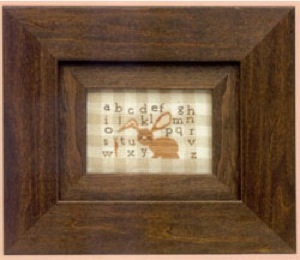 Description: This bunny can be stitched and framed or as we chose...a scissor weight. Stitched on 32 count Dirty Belfast linen by Zweigart from Norden Crafts with one strand of Weeks Dye Works hand-dyed fiber over one linen thread. We stitched ours just for the wonderful pair of black DOVO scissors. This small chart also includes an alphabet for personalization. Description: 30 count hand-dyed Hog Wild Blue linen from R&R Reproductions with one strand of Sampler Threads over one linen thread. If you choose to use any other fiber, you will not get the same appearance as our model. This design can certainly be stitched over two linen threads with two strands of thread. We love the new frame collection, This Old House, from East Side Mouldings and put our design in a delightful color called Parlor Green(OHPG)! Description: 32 count Flax Belfast linen by Zweigart from Norden Crafts with Sampler Threads from The Gentle Art. Frame by East Side Mouldings - 300BK/OHPF. This design can be stitched over one or over two linen threads. This old jump rope song is for my Momma, who turned 90 on January 7, 2007 and has Alzheimer's. 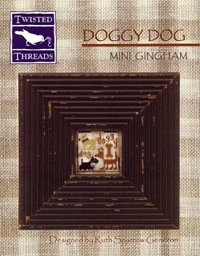 Description: 28 count Riviera Gingham (Cream/Natural) linen by Graziano from Norden Crafts, Ltd. over one linen thread with one strand of Sampler Threads. If you choose to use any other fiber, you will not get the same appearance as our model. Framed in a double East Side Mouldings frame 3300SP/3200SP. Correction to chart: The chart omitted a symbol in the color key for the tops of the Christmas lights. It is a heavy sideways H. Please use Sampler Threads Slate. The conversions for this color are Anchor 398 or DMC 415. Description: 32 count Summer Khaki Belfast linen by Zweigart from Norden Crafts, Ltd. with one strand of Weeks Dye Works over one linen thread. If you choose to use any other fiber, you will not get the same appearance as our model. We framed ours in a frame from Olde Colonial Designs: PR1595. Description: 28 count Riviera Gingham (cream/natural) linen by Graziano, from Norden Crafts, Ltd. with one strand of Sampler Threads from The Gentle Art over one linen thread. If you choose to use any other fiber, you will not get the same appearance as our model. 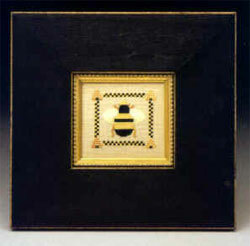 Framed in a 2” x 2” East Side Mouldings frame: OHUEL. 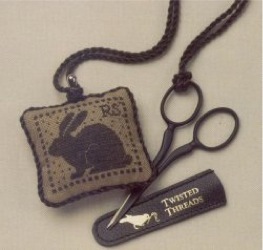 The tag charm (CH10) is available through Twisted Threads. Description: 28 count Riviera Gingham (Cream/Natural) linen by Graziano from Norden Crafts over one linen thread with one strand of Sampler Threads. If you choose to use any other fiber, you will not get the same appearance as our model. 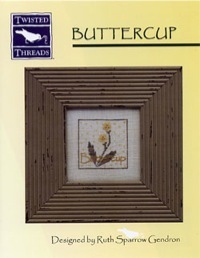 The Bitty Bee (CH08) buttons in this design are available from Twisted Threads. Framed in an East Side Mouldings frame OHPJ. 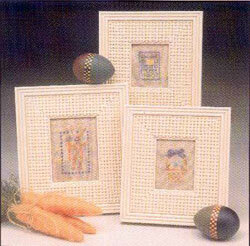 Description: Celebrate Easter joyously with our three quick-to-stitch designs. All three designs are stitched on 32 count Natural Belfast linen by Zweigart from Norden Crafts with one strand of floss over one linen thread. Any of these designs can be stitched over two linen threads with two strands of floss. We stitched ours with two colors of Simply Shaker Sampler Threads from The Gentle Art and Anchor floss. 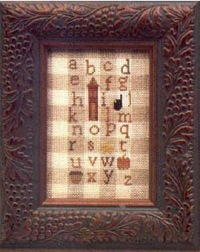 The basketweave frames are from Olde Colonial. Description: 32 count Natural Belfast linen by Zweigart from Norden Crafts over one linen thread with one strand of Sampler Threads. This design may be stitched on any count of linen. 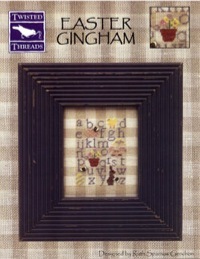 The frame size shown is for 32 count linen stitched over one linen thread. If you choose to use any other fiber, you will not get the same appearance as our model. 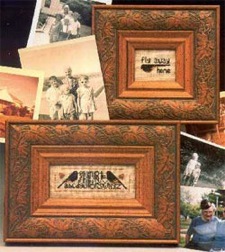 Our punched tin frame (TF09) is available through Twisted Threads. Description: The autumn of 1972 found me leaving the Sparrow nest for college at the young age of sixteen. In the spring of 2002, nearly thirty years later, it was time to come back home to my family. Fly Away Home is dedicated to my sweet mother, who has been my greatest inspiration and my father, who has believed that I could do anything. Both designs are stitched on 32-count Flax Belfast Zweigart linen from Norden Crafts over one linen thread with one strand of Sampler Threads from The Gentle Art. If you choose to use any other fiber, you will not get the same appearance as our model. We have used spike buttons for the Bird Sampler from Just Another Button Company. Both frames (X2348) are from Olde Colonial Designs. 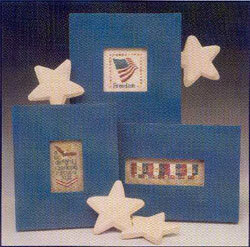 Description: God Bless America and the Eagle Sampler are stitched on 32 count Dirty Belfast linen by Zweigart from Norden Crafts with one strand of floss over one linen thread. Flag of Freedom is stitched on 32 count Country French Latte from Wichelt Imports with one strand of floss over one linen thread. Any of these models can be stitched over two linen threads with two strands of floss. These designs were stitched using Weeks Dye Works. We put ours in wonderful wide frames from Wood N Needle. 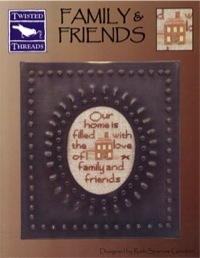 Description: Friends is dedicated to two very special people....Judy and Frank Bielec of Mosey 'N Me... for a mulitude of reasons. Stitched on 32-count Bonnie Blue Royal Crown (65-202) linen from Wichelt Imports with Sampler Threads from The Gentle Art with one strand of floss over one linen thread. This design can also be stitched over two linen threads with two strands of floss. Description: From The Heart is truly one of my favorite designs. It is stitched on 32-count Chestnut linen from Wichelt Imports, Inc. with shades of warm chocolate brown and rose Anchor floss. There are three little spider web rosettes to finish the piece. Bob Reed from Olde Colonial Designs created the perfect Itty Bitty Treasure box for it, and we think it would make the perfect presentation for a gift to a special friend. It is a real treasure!